I am working for the state or Oregon Drinking Water Program and live in Portland, Oregon. From 1994-2000 was a Fellow for the U.S. State Department's EFL Fellow Program in the Czech Republic ('94-'96), Slovakia ('97-'98) and Macedonia ('98-00). Now I am the Coordinator of Intensive English Programs at Pierce College, Lakewood, WA and living in Tacoma, WA. I loved working in Mustang the best! My friends in Pokhara were the most awesome on earth! I love you and miss you, Pokhara Gang! I'll probably be a PCV again one day! Any RPCV who served in Nepal! UN volunteer in China, 1989-1992; UN volunteer in Indonesia, 1994-1996; university instructor in Taiwan, 1992-1994; doctoral student and university instructor at George Mason University, 1996-now. I'm looking for Steve Knapp. Steve, where are you? Update the links on the 'Friends of Nepal' site ... there are none at the moment!!! Currently working as a College Counselor in Dar es Salaam, Tanzania at an international school. two entries, one has an old email address (@oakhill). The yahoo email address is the correct one. I returned to Michigan, graduated from Western with elementary teaching certificate. Worked 2 years at Kalamazoo Nature Center, then 14 years as classroom teacher in Sturgis. Married in 1988 to Kamela Britvec, 2 children. Currently teaching at Glen Oaks Comm. College, working on a masters in geography, and selling wildlife photographs. My job was not well defined, so I wound up working on several government farms in Western and Eastern Nepal, and eventually wrote a training manual on gardening for other volunteers. Wish I would have had more training in problem solving and planning. I was not very effective, and sick alot of the time, but 20 years later I am very nostalgic about my experiences. Memories are very vivid and fond. Assisting the Nepal government in setting up village and district level government, --with a focus on economis/community development. Teaching at U. of Hawaii: Maui Community College from 1967 to 2001. Live on Maui and invite Nepal 2 visitors. A very formative period of my life which has given me the skills and motivation to keep involved in my community's development. school at the University of Texas. Got a Masters in Social Work. Coordinated an HIV/AIDS grant in Missouri. Did health research for the state of South Carolina. Now in the PhD program in Social Welfare at UC-Berkeley. the "Directory of Volunteers": You have two incorrect email addresses for me. life...and it was life changing. with Tex and Andy Daly...where are you? engaged in creating a web page for FoN. It was truely a formative exterience. significant assistance at the grass root level in the country. Most profound 2 yrs of my life. I am humbly grateful for the experience. young man from so far away. been affected by or informed by my Peace Corps experience. Peace Corps leadership -- It's the best antidote to terrorism there is. facility to be full time mom. Physician practicing internal medicine in Philadelphia, PA.
Married with two grown children. Currently in a master's program in public health at Johns Hopkins. MFA UCLA - theater design and technical direction. consultant working in economic development in the U.S.
Dakota after a few months of travel around South East Asia and the Pacific. The best time of our lives...we say. Being a Volunteer was extremely rewarding. Seminal time of my life after breast feeding. and community college 3 years. Started a nature photography business. unique and intense experience that is still vivid in my memory. where I've been for the last two years. Department of Agriculture as a Field Inspector. Anyone who served in the 182 or 183 groups. What a long, strang trip. completed two masters and a doctorate degree; have continued to work in international development with the last 20 years spent at the Academy for Educational Development. Currently running a malaria prevention program for sub-Saharan Africa with my base in South Africa. Have continued with international development, working in Nepal, Bhutan, China, Mongolia and Central Asia. Peace Corps was one of the best experiences of my life. Started in Morocco. Went through training and then had no position. Transferred to Nepal. International Development work, U.S. work, several degrees, 2 kids, same husband (Carson). Especially John, Peggy, Vince, David: Ethiopia. Nepal-- everyone. Working at PC HQ from 1999 to present. Living in DC. Married, Working in financial sector. Great times, miss the simplicity of life. I am in a PhD program in management information systems in Athens, GA and just got married in December 2002. Several RPCVs attended. Nepal RPCVs of the 184-187 era. My time in the Peace Corps was the most difficult, yet most rewarding experience in my life. It taught me that most of the difficulties that I face with life in America are insignificant compared to the daily struggles in other countries. Presently working for the USGS-Biological Resource Division, Marrowstone Marine Station in Washington State as a fishery biologist. Best thing I ever did. FBeacame a Foreign Service Officer with USAID, served in Haiti, now I am an attorney with specialization in international law. Water Supply and Energy consultant working as project manager and water/energy engineer on World Bank, ADB and USAID projects in 25 countries, particularly Southeast Asia and South/East Africa. Good to have gone back to Nepal several times working on WSS development projects, meet many old and new friends, and see how things have changed. Everyone should do Peace Corps at least once, just to see how the rest of the world lives and thinks. Best years of my life! I taught and was an assistant principal in the NYC Public Schools as a Peace Corps Fellow at Columbia University's Teacher's College. I left teaching to attend Harvard Law School. I briefly returned to Nepal to work with Bhutanese refugees in Jhapa. After law school I clerked in LA, then worked at a youth center in NYC, The Door, providing general legal services to young people. I then completed two years as the Gibbons Fellow in Public Interest Law in NJ before moving into law teaching at NYU's Lawyering Program. I am now an Associate Professor of Law at UNLV's Boyd School of Law where I direct an Immigration Clinic that provides free legal services to the immigrant community. I am married and have a two-year-old daughter. Foreign Service Officer with USIA. Served in Nepal, Laos, Lebanon, Zaire, India and Sri Lanka. Retired in 1987. Published writer of poetry, short stories, travel memoirs and essays. Wife, Etrennes, originally from Lucknow, India, tutors French and teaches English as a Second Language. Wish I could go again, to E. Africa this time! Nepal never leaves you. I can still speak passable Nepalese after 30 years. I taught high school science and math. MS and EdS in adult education from Florida State University. Instructional Designer for U.S. Senate (7 years) and Northern Virginia Community College (17 years). Recently retired to draw and write full time. Any friends from N24 or the Janakpur area 1970-74. 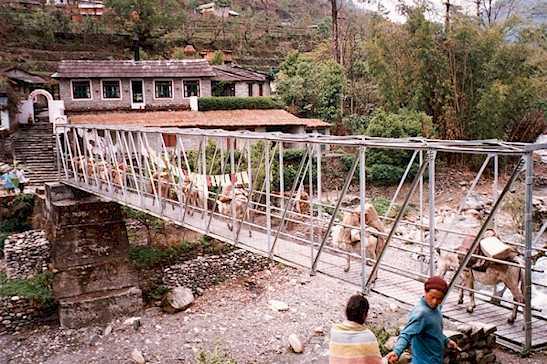 I was in the Community Water Supply (CWS) program, constructing gravity-flow water systems in mountain villages. At the end of my tour, I was retained by UNICEF Nepal to write a field handbook on designing & constructing such systems, for use by PC and similar organizations in Nepal. Any of my former PC friends or other CWS volunteers. Serving in Tourism field in Nepal for 4 years .And , Very much interested to join Peace corps and serve the country . Keep always on mind helping people gives you a refreshment of the life. Hope to get on touch from you soon ! Yes, from those who I worked with. After I saw the US it was very amazing to think how you could work in Nepal in such a hard situation which you cannot even emagine. Starting independent non-profit connecting Nepal and Colorado. Moving back to Kathmandu. Wow! Roller coaster - incredible personal experience thanks to Volunteers and community. Incredibly frustrating experience thanks to administration. Still very much involved with Nepal. I am Chairman of the Board of Ama Ghar and Orphanage in KTM. I have an import/export business that takes me to Nepal every year. I have an adopted Nepali daughter. The daughter of one of my counterparts is is living with us for the last four years studying nursing. My Peace Corps was important of life. Nepal still is. all the guys in my program. We had a really great group. Living in North Carolina. Married, kids, minivan, cat, hamsters. If I only knew then what I think I know now. Still my defining experience, e.g., without which I would not have spent 22 more years in Asia. Any Nepal 9 - 12 PCV's. Currently working for The Nature Conservancy at Aravaipa Canyon Preserve in se Arizona. Anyone in training group, especially Ben. Chankged my life forever. I learned far more than I taught. Her name was Heather-Heather M Hibbard. She was gentle and very friendly. She worked as a peace corps volunteer at the District Agriculture Development Office at Ilam, Nepal. Her address, if I have remembered correctly, was yellowstone, concord, Ohio. The thoughts of that good friend and her parting "goodbye" has been haunting me so much that after more than a decade(and after I have learnt a little of this modern means of communication) I have started searching for her again.The year was 1995-96 and as I recollect she was 26-28 yrs old at that time (I was 20). I would be very grateful if anybody would help me find her. I am trying to contact Mark (I do not know the real name), he served as a Peace Corpse Volunteer (teaching math and science) in Jaya Narayan High School, Panthar, Mehelbotey. Pete Fritts, better known as Peter, was my teacher at Sirubari Syangja back in late sixties. Martha Kate, then, Fritts, was another teacher. Heard a sad news, that Martha is no more present physicallly. I remembr her a lot and pray for her departed soul. I am looking my friends ,their names are Curt Schular and Cris Carusi ,who worked in baitadi patan .if anybody know address 'please write me .I want contact both of them.